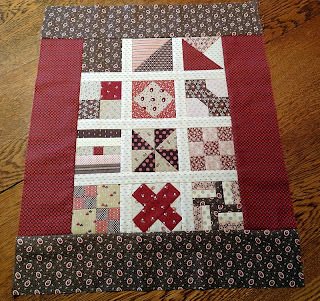 Squash House Quilts: Twelve Days Flimsy! Are you surprised to see me posting so much this week? I know I am! Believe it or not I've been doing a lot of sewing, just nothing that I've been able to show for a while! 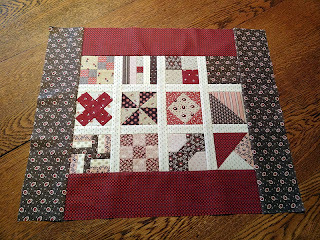 Several days ago I showed you the blocks to my 12 Days of Christmas from Temecula Quilt Co. I finished the flimsy yesterday! I was so happy to see their finishing instructions as I happened to have just the right colors in yardage to finish it in Miniatures! Here is it sideways, which I like a little better. Mr. Squash asked me what I was going to do with this quilt. If I can quilt and bind it by Valentine's Day it will be the perfect colors to hang on my entryway quilt rack! It will be bound with the red border fabric you see here. I'm really trying to be a better blogger these days. Unfortunately due to our terribly dry weather, many of my fingertips are badly cracked, which deters from typing!! Seems I just get several healed, then they break all over again! I've been through several different types of liquid band aid which works pretty well, though. I know many of you suffer from the same thing - if you've never tried liquid bandage, I highly recommend it! Be sure to come back tomorrow for another big reveal! Very nice 12 Days mystery quilt. I like the colors-----Red, will look perfect at Valentines. Darn those dry cracked fingers, they really hurt don't they? What a darling addition to your Valentine's Day decorations. How's Vinnie going to quilt this one? My hands too are so dry. It has been making it hard to work on my applique projects. Sweet mini! Have a good day! Sweet little quilt! My fingertips have started cracking again too. Lots of handcreme many times a day, and some heavy stuff like Hemp Hand Creme from Body Shop for the night and cotton gloves on. Adorable mini and I especially like your fabric choices. that would work great for Valentines, as well as every day, not too bright, just right! Have you tried Aquaphor by Eucerin? this is amazing and their cremes were recommended when I was getting radiation. The ointment is excellent for chapped/cracked/dry skin. It's wonderful, Candace. Your color choices couldn't have been better and perfect for Valentine's Day. Love your 12 Days - the colors are yummy! Get those fingers healed up so you can keep typing! 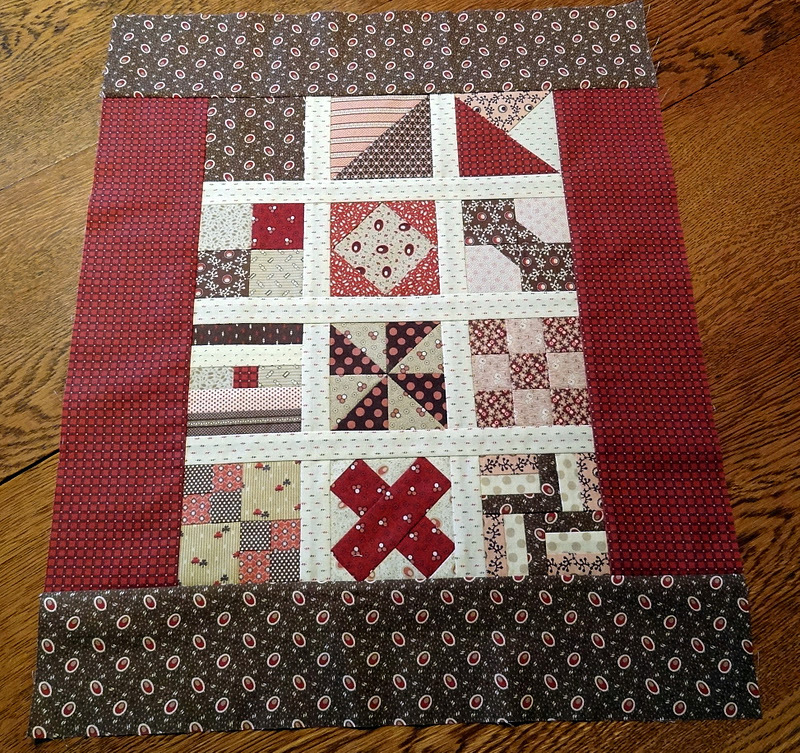 The light colored sashing really makes your 12 squares pop. 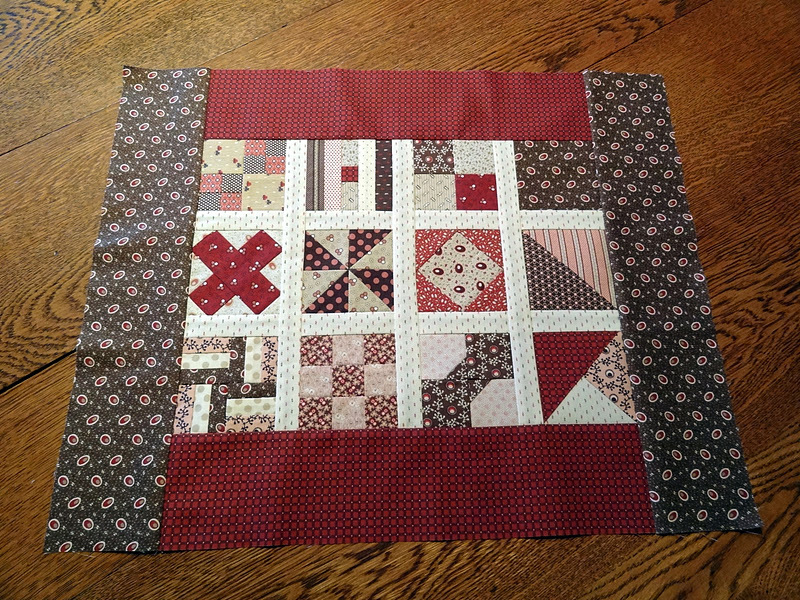 It's so nice to see how versions of this mystery quilt project have turned out.